Online Shopping in Dubai: Shop for Leitz Mini Bluetooth Speaker Online at Menakart. 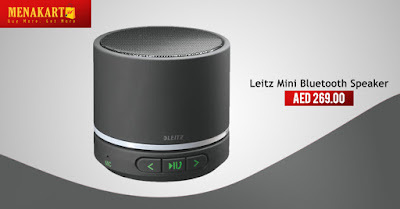 Shop for Leitz Mini Bluetooth Speaker Online at Menakart. Crystal clear sound from full-range stereo speakers, a down-firing subwoofer and a passive radiator. Wireless Bluetooth technology easily pairs with your Bluetooth enabled devices. Stylish tabletop design finished in high-gloss optic. Volume controls on the top. Adjustable bass and treble controls on back.